We are so thrilled to be hosting our first floral arranging workshop with Strawberry Fields Flowers and Finds! September 20th Deanna King will be teaching you how to create a beautiful arrangement with locally sourced flowers and lush greenery. 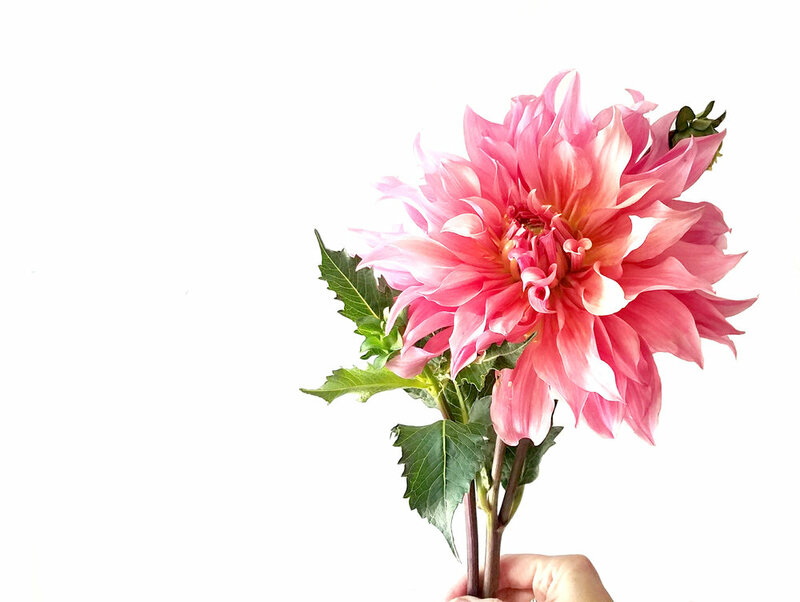 Each attendee will construct their own bouquet in a handmade pink vessel by Mary Hooper. Workshop fee includes instruction as well as all materials and no experience is necessary. Sign up by calling the gallery at 804 340 6036. Limited spots are available! Here is a little information about Deanna King, owner of Strawberry Fields Flowers and Finds and the instructor for this floral arranging workshop! I was born and raised in Rochester, New York. My dream of owning a flower shop began in my youth. I have always loved flowers & plants- pretty things! My experience working at Bauman’s Farm Market & Greenhouse really sparked my passion for floral design. I attended VCU and became a teacher for ten years. I was given the opportunity to buy Strawberry Fields from the previous owners, who I had actually worked for during the summer. My husband was extremely supportive of this venture and here I am ten years later. Having my shop, Strawberry Fields Flowers & Finds, has given me the opportunity to infuse my passion for floral design into the Richmond community & make my dreams come true. We asked Deanna a few questions about the workshop and floral arranging in September! Quirk Gallery: What will be the style for this floral arranging workshop? Deanna King: Loose, airy, gardenesque, picked from the field. We source our flowers from several local flower flowers including Wind Haven Farm in Topping, VA, Prospect Hill Farm in Bumpass, VA, Essex Farm in Tappahannock, VA and Burst and Bloom in Powhatan, VA.
Can you give us a few tips for floral arranging at home? 1. Always keep your vase and water clean; the flowers will last so much longer if you change the water every few days, clean the vase, and re-cut your stems. 2. Keep your flowers in a cool place, not near a heater or the direct sun. 3. Criss cross your stems while arranging to keep your flowers in place. In contrast to the blooms in Spring and Summer, what are your staples for floral arrangements in September? In September we commonly use more fall colors, berries, veggies, etc. Items such as dahlia, crocosmia, ornamental cabbage, artichiokes, thistle coxcomb, etc. An arrangement featuring artichoke, cabbage, bittersweet, dahlias among others. $75 per participant includes 1 hour of instruction from Deanna King, locally sourced flowers and greenery, and a vessel for your arrangement handmade by Mary Hooper.